(Nanowerk News) Along with the neutron, the proton is the basic building block of the atomic nucleus. But, the source of the proton’s spin—a fundamental property, along with charge—has been a long standing puzzle to scientists. By analyzing data from the BNL Relativistic Heavy Ion Collider (RHIC), the PHENIX collaboration at Brookhaven National Laboratory in Upton, USA, including scientists from the RIKEN BNL Research Center and the RIKEN Nishina Center for Accelerator-Based Science, has now ruled out gluons—the particles that exchange the so-called strong force between the quarks that make up the proton—as the dominant contributor to proton spin (article). 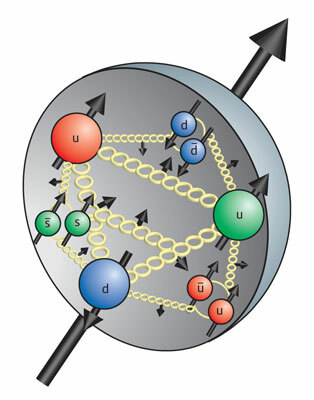 There are three quarks—two ‘up’ quarks and one ‘down’ quark— in the proton (Fig. 1). Each quark has a spin of ½ and they configure with respect to each other—two up and one down—so the sum of their spins is ½. For this reason, scientists thought the spin of the proton, which is also ½, came entirely from quarks. Experiments in the 1980s, however, showed that quarks only contribute about 25% of the total spin of the proton. “This result was so surprising that it was called the ‘spin-crisis’,” says Yasuyuki Akiba, a member of the PHENIX team. Particle physicists were therefore confronted with a fundamental question: What else contributes to the spin of the proton? Some models predict that the missing spin comes mainly from gluons, while others suggest that the contribution from the orbital angular momentum of quarks within the proton may also be significant. To determine the contribution from gluons, the PHENIX team analyzed data from a year-long experiment performed at RHIC in 2006. In this experiment, protons were collided at very high energies approximating 200 GeV, where 1 GeV is equal to one billion electron volts, to produce particles called pions. The researchers derived the gluon contribution to the proton spin from the difference between the number of pions produced by colliding protons with their spins lined up in the same direction to one another versus those lined up in opposite directions.